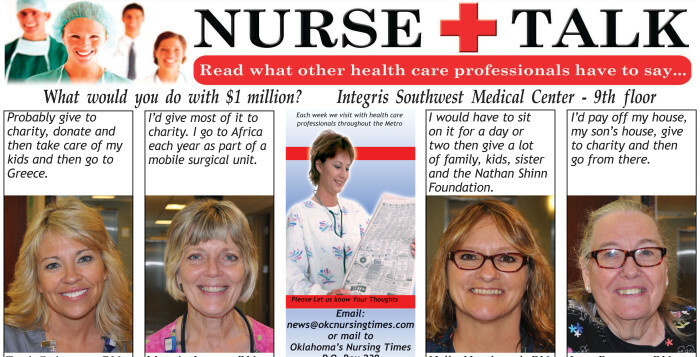 Nurse Talk: What would youdo with $1 million? 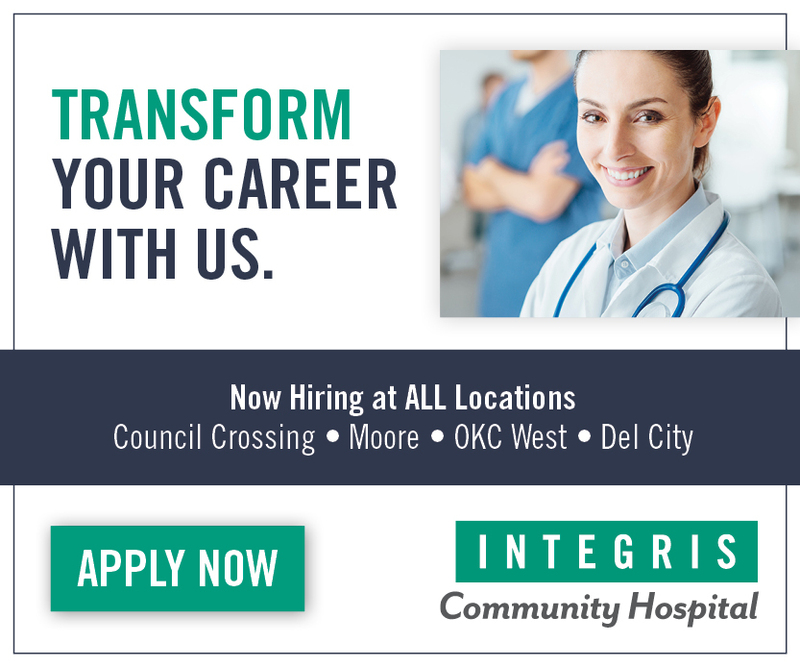 THE PLACE TO SERVE AND GROW – CHECK OUT THESE RN OPENINGS! 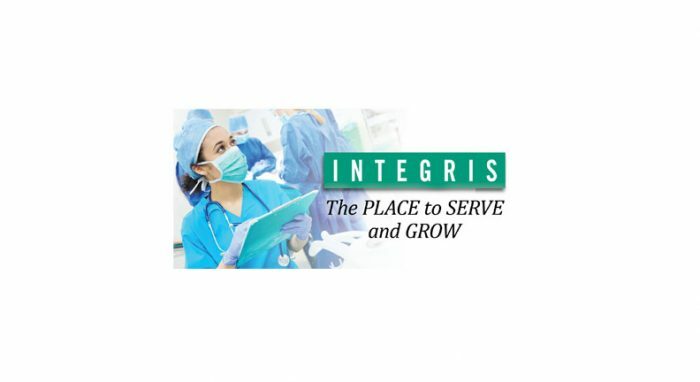 GO TO: integrisOK.jobs, click careers and copy and paste the job number listed with position to be taken directly to the complete job description and apply online. If you find yourself looking for James Brigida, you will most likely have to look up in the sky. He will be one of the three crew members on the Medi Flight helicopter. James is a Flight Nurse and a National Registered Paramedic. Born in Las Angeles, CA and raised in the bay area, James was in his early twenties when he decided to visit a cousin in Oklahoma. He liked Oklahoma so much, he decided to move here and go to nursing school. That was sixteen years ago and he has enjoyed his job ever since. 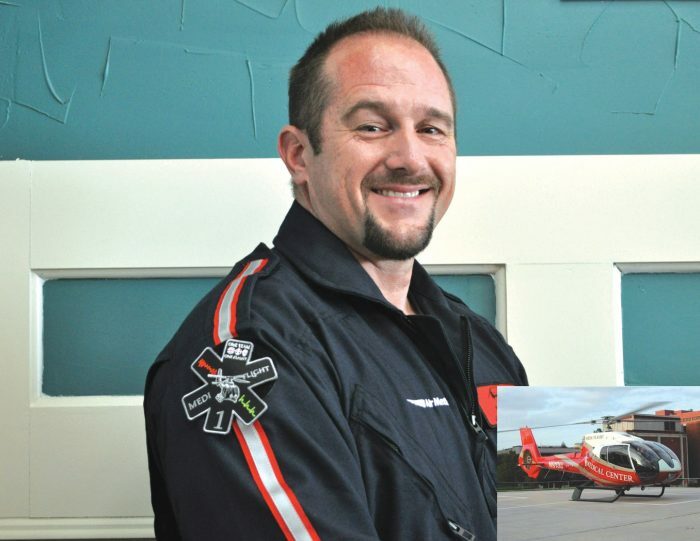 Having a job as a paramedic in 1998, he soon had the opportunity to be a flight paramedic. From there, he became an RN, and then a Certified Flight Registered Nurse. “I was getting great critical care experience and good basic knowledge. Now, I work for Medi Flight based out of Chickasha, OK and the parent company, Air Methods is based out of Denver, CO,” he said. James explained how the helicopter crew consisted of one pilot, one nurse and one paramedic. “We have to do some life-threatening actions. There are two different types of flight emergencies calls. 1. Scene flight; a call made by a firefighter or a policeman. 2. Transfer call; these are the phone calls usually coming from smaller towns where there is no hospital; needing to transfer the person by helicopter,” James said. “Either way, the flight nurse and paramedic have to know what to do, how to do it and when to do it. We have seconds to take care of that patient in a unique and isolated situation while we are 1,000 feet in the air. We have to have critical thinking skills, performing emergency procedures. Seconds count! The flight nurse and flight paramedic work as equals,” he added. “Flight nurses have bits of the same schedule as a firefighter. We work 24 hours, twice a week. We have eight flight nurses and eight flight paramedics with four shifts, rotating the schedule. Medi Flight is at Grady Memorial Hospital in Chickasha, OK. Mr. Deacon Vice is the Medical Director of the ER there,” James commented. Does the helicopter fly in any weather? “Actually, the pilot of the helicopter is like a weatherman. They have to know all of the weather conditions before taking off. There has to be 1,000 feet from the ground to the ceiling (clouds) and be able to see two miles ahead for visibility. In the winter, they have to watch for the helicopter freezing over,” James replied. What advice would you give to someone if they wanted to be a flight nurse? 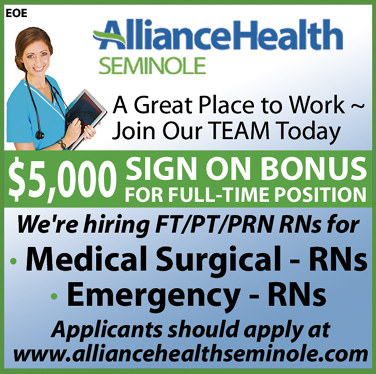 “I would encourage them to start out by getting experience in the critical care unit. The reason is the fact that all of this training and experience will get them closer to becoming a flight nurse. Also, get all of the certifications you can. It will be even better when you try to get a job as a flight nurse,” James answered. Living in Edmond, OK, James is married to the love of his life, Patty. They have three children, Matthew, 18, Dante, 20 and Alejandra 22. James’ hobbies include exercise; working out at a great place called True Grit in Edmond, OK. “It can be a great stress-reliever,” James said. “That’s pretty much my hobby. Working out and sleeping. I love to sleep,” he said with a laugh. From the days of his childhood, dreaming of aviation and flying, James is blessed to have the title Flight Nurse. “I get to take care of patients and fly in a helicopter. I continue to learn and use my critical thinking skills in my everyday job. I have a wonderful family and I continue to help others in any way that I can, in the air and on the ground,” James said. Asking James to sum up his life in one word, he answered, “passionate”. 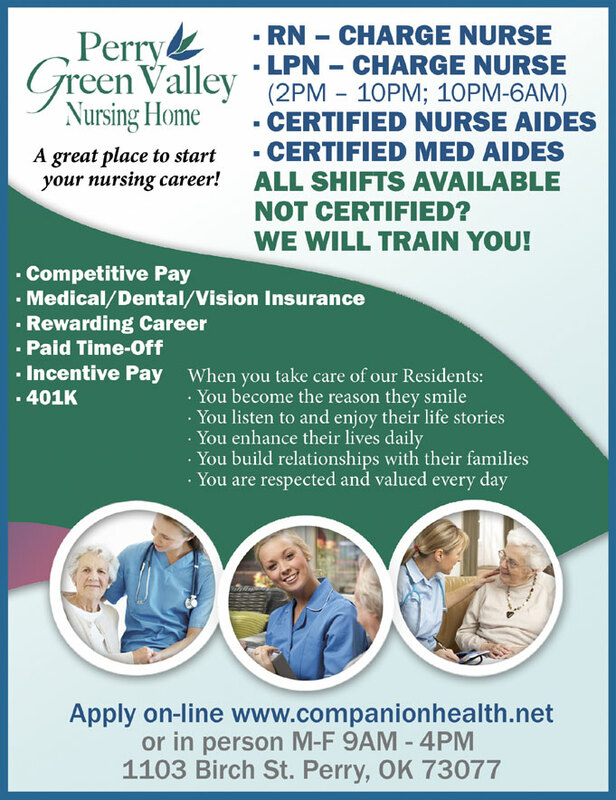 A great place to start your nursing career! 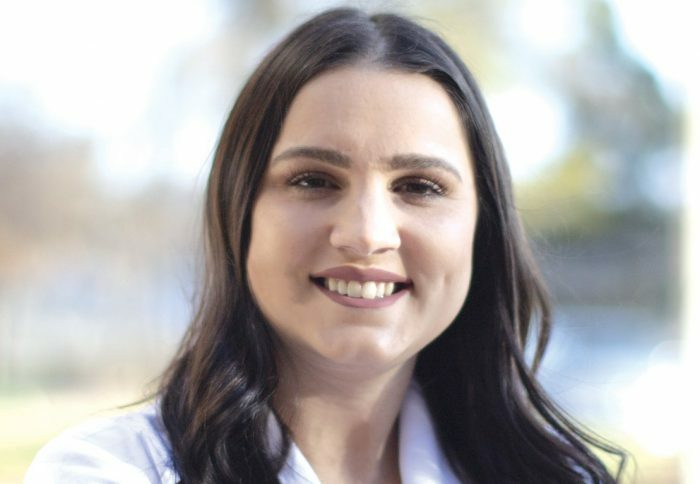 DeAnna Looper, RN, CHPN, CHPCA is a graduate of Tulsa Junior College with an AS in Nursing and continued her education at Kaplan University and University of Oklahoma. Danny Cox, BSN, earned his nursing degrees from the University of Cincinnati. DeAnna Looper, RN, CHPN, CHPCA, was named Chief Compliance Officer, and Danny Cox, BSN, was appointed Senior Vice President of Clinical Operations for Carrefour Associates, the management firm for Crossroads Hospice & Palliative Care, one of the nation’s leading hospice care providers. Looper brings more than 40 years’ experience in healthcare, education and administration to this newly created position. As Chief Compliance Officer, she will oversee all clinical, legal and regulatory compliance operations across 11 Crossroads sites in seven states. She served most recently as Senior Vice President of Clinical Operations, refining her expertise in regulatory, clinical and legal compliance and promotion of clinical excellence through education of other Crossroads leaders. 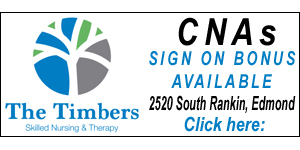 Joining Crossroads as a nurse at its founding in 1995 and advancing through several operational roles, Looper has been instrumental in leading the organization to the forefront of the hospice care industry. A graduate of Tulsa Junior College (now Tulsa Community College) with an AS in Nursing, Looper continued her education attending Kaplan University and University of Oklahoma. 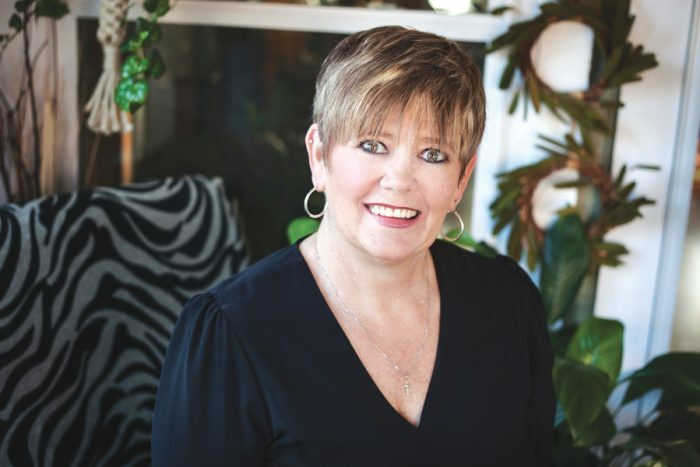 She earned certifications as a Hospice and Palliative Care Nurse, Hospice and Palliative Care Administrator, Legal Nurse Consultant, Grief Recovery Specialist, HPNA Approved Educator and ELNEC (end-of-life care) Trainer. She is a member of the Hospice and Palliative Nurses Association, Health Care Compliance Association and the Society of Corporate Compliance and Ethics. 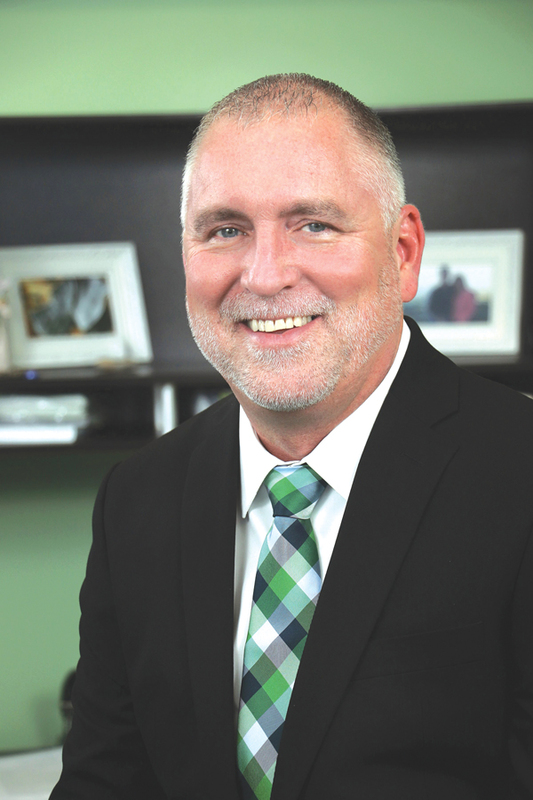 Cox advances to Senior Vice President of Clinical Operations from his previous position as Clinical Consultant for Carrefour, a key clinical operations role he has held since 2014, successfully leading the implementation of a new hospice-specific electronic medical record platform across all 11 Crossroads sites. In his new role, Cox will be responsible for leading the enterprise-wide integration of all clinical operations for Crossroads. Cox joined Crossroads in 2011 as a Clinical Director at its Cincinnati, OH, location. Cox earned his nursing degrees from the University of Cincinnati, where he also served as an adjunct clinical instructor in nursing before joining Crossroads. “With their combined expertise in hospice care, regulatory compliance, clinical operations and administration, and a shared passion for providing exceptional, compassionate care to our patients and their families, we are pleased to deepen our leadership bench with these outstanding professionals,” said Crossroads CEO Perry Farmer. Crossroads Hospice & Palliative Care is committed to being at the forefront of the hospice care industry, continually shaping the way end-of-life care is viewed and administered. Crossroads’ mission is to provide highly unique, comprehensive, and compassionate hospice services to persons experiencing a life-limiting illness and to their caregivers. 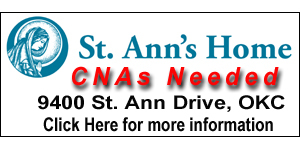 Visit www.crossroadshospice.com for more information. 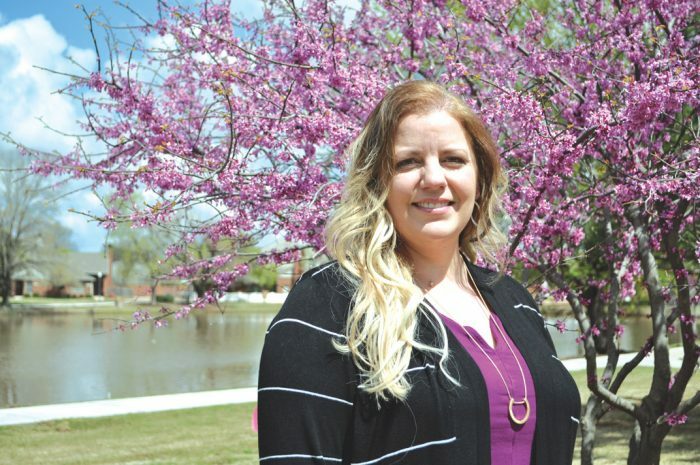 Stephenie Burleson, LPN is the Residents Services Director at Lyndale Senior Living in Edmond, OK. With a friendly smile, it is easy to see why she is perfect for her job. 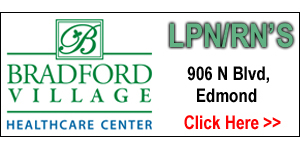 Lyndale is a community of cottages, independent living and assisted living apartments located in the sought-after town of Edmond. 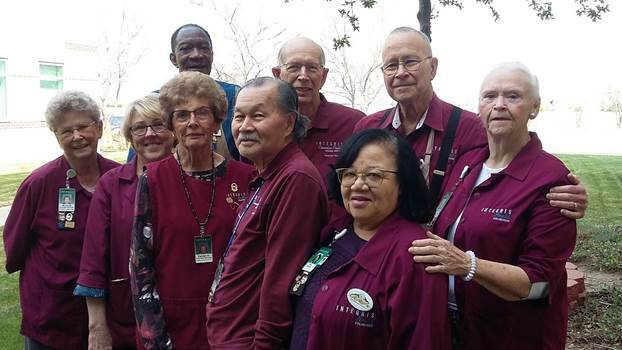 Operated by Sagora Senior Living, Lyndale’s philosophy is to place their residents first by following through with Sagora’s core values of commitment, communication, empowerment and excellence. 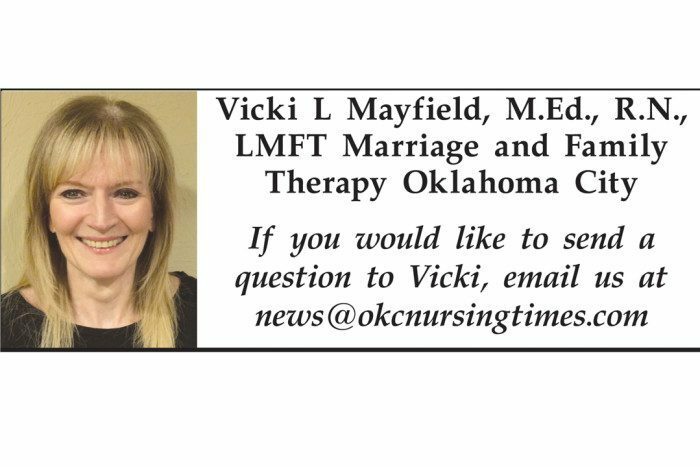 Meet Stephenie Burleson, LPN, Residents Services Director at Lyndale Senior Living in Edmond, OK. She has been a nurse for eight years and has been with Lyndale for two years. Stephenie grew up in a small, two-story farm house. Living with her single mom, she was the oldest of four children; a protector of her siblings, the little mom, the nurturer of the family. At fifteen years old, she actually delivered her baby brother when her mother could not get to the hospital in time. The ambulance was called and it took two more calls after that for them to believe it wasn’t a prank phone call. “I was so scared but I knew it was up to me. I did it though and everything was fine,” Stephenie said. Also, at that time, my grandparents moved into a senior home, so from that point forward, I felt like I needed to be an advocate for seniors and wanted to become a nurse, focusing on geriatrics,” she added. What is your favorite part about your job? “I love getting to see the residents smile every day. They have so much to say; the stories they tell about their experiences. The residents are fun. We are like one big family,” she said. What qualities make a good nurse? “A nurse needs to have plenty of compassion. They need to be knowledgeable and they need to have a heart for caring for others,” she replied. What advice would you give to someone going into the medical field? “I would tell them they have to start small; start from the bottom up. Learn as much as you can. I plan on going back to school in the near future and learning more and advancing my career. I would also tell them that the hands-on-hands learning is one of the best things they can do. It teaches you so much. I would tell them not to be afraid to try something new. You will be a better nurse all the way around and most important, continue learning, learning, learning,” she replied. With Stephenie living in Choctaw, OK means a little bit of a drive to Edmond every day but loving her job makes it well worth it. When not working at Lyndale, Stephenie enjoys spending time with her two sons Kaleb – 16 and Cameron – 12. “I bring my sons to Lyndale a lot and the residents love it. I definitely try to do the right things and be an example to my sons,” she said. Ali Graham, APRN with The Children’s Center Rehabilitation Hospital in Bethany. The Children’s Center Rehabilitation Hospital is pleased to welcome Ali Graham, APRN, to its medical staff. Graham earned her undergraduate degree in nursing from Oklahoma City University. She then went on to complete a Master of Science in Family Nurse Practitioner at Graceland University in Independence, Missouri. “I always wanted to work in health care. I love children and working at the hospital allows me to treat patients and help their transition from hospital to home,” said Graham. To learn more about The Children’s Center Rehabilitation Hospital, please visit our website at www.miracleshappenhere.org. 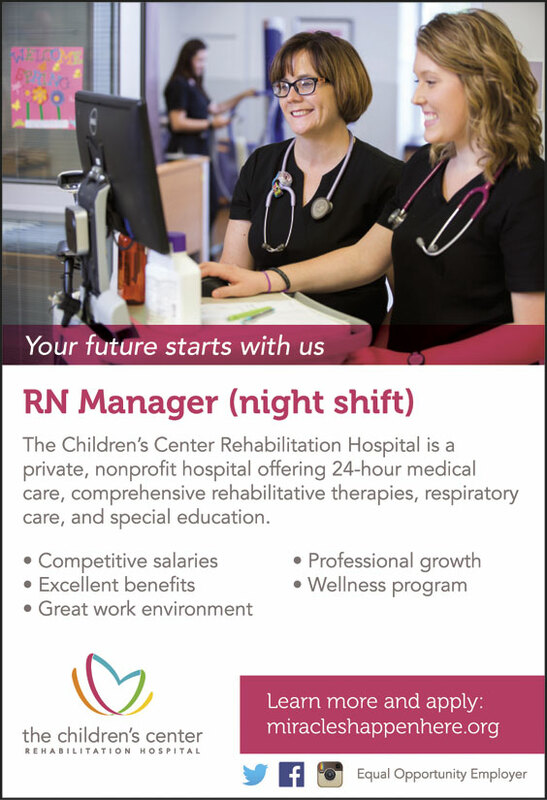 The Children’s Center Rehabilitation Hospital is a private, nonprofit hospital offering 24-hour medical care, comprehensive rehabilitative therapies, respiratory care, and special education. 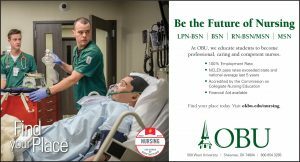 There is no better place to earn an RN degree than by attending OSU Institute of Technology and receiving an Associate in Applied Science Degree. 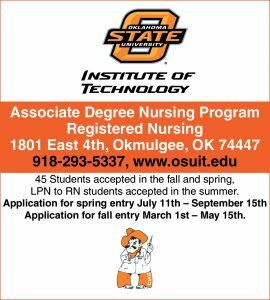 The OSUIT Registered Nursing Program is approved by the Oklahoma Board of Nursing and accredited by the Accreditation Commission for Education in Nursing (ACEN). “Our nursing labs feature advanced simulation mannequins – enabling practice for a wide range of nursing procedures. 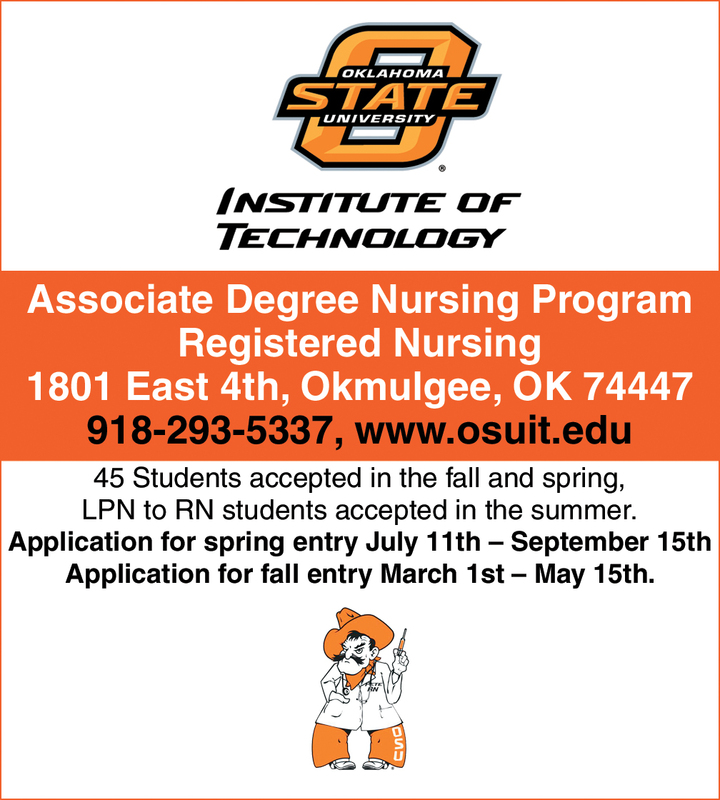 OSUIT’s Nursing Program provides: hands-on learning environments, experienced faculty, numerous employment opportunities with excellent salary potential, smaller cohorts, caring faculty, and faculty that want you to succeed,” states Dr. Jana Martin, dean School of Nursing and Health Sciences. “We’re very proud of our graduates and the quality of our program. Upon successful completion of the degree program, faculty continue to monitor the student and their NCLEX-RN preparation. We guide them for success on licensure,” Martin states. Upon successful completion of the NCLEX-RN, graduates are eligible for employment as a registered nurse helping people in a lifelong career that provides both personal satisfaction and great income. Dr. Martin said in the last several years OSUIT’s NCLEX pass rate has improved, and the trend seems to be continuing. Our graduates are normally offered a job before they graduate. “Everything we have done, and our accomplishments are because of our faculty,” she said. “They stay up to date on best practices and new technologies.” It’s all in service in making sure the students are prepared and knowledgeable when they start their careers. 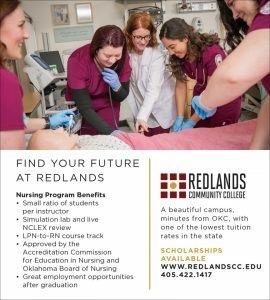 “We believe that our program prepares them for success not only in passing NCLEX-RN but the career of nursing as well,” Martin said. 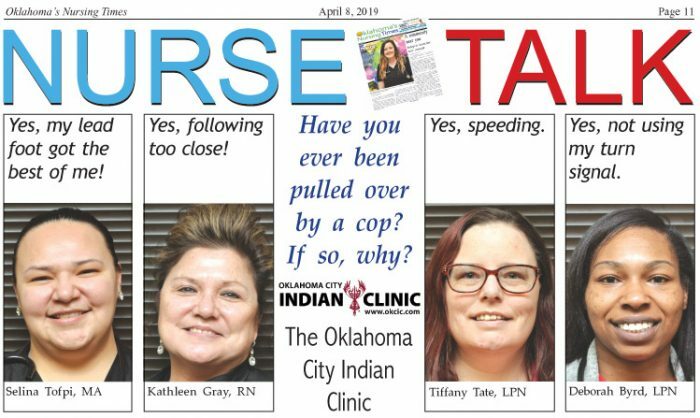 NURSE TALK: Have you ever been pulled over by a cop? If so, why? Yes, my lead foot got the best of me! Yes, not using my turn signal. 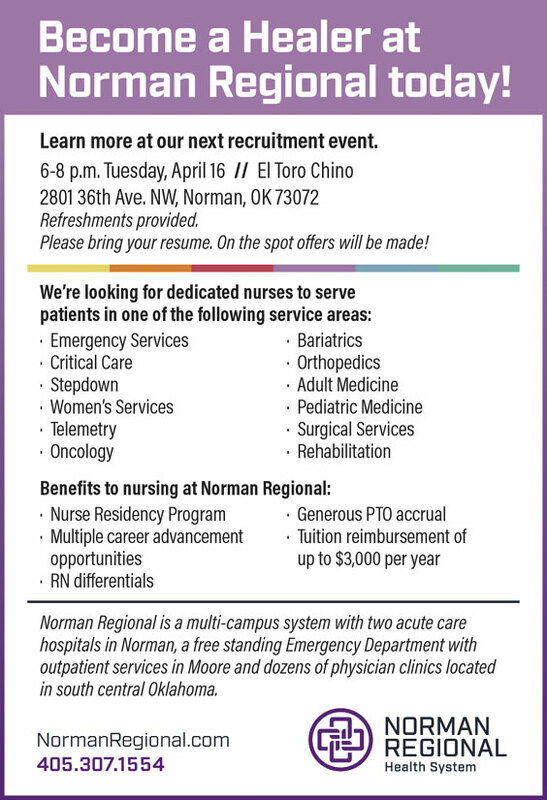 Become a Healer at Norman Regional today! Learn more at our next recruitment event. Please bring your resume. On the spot offers will be made! 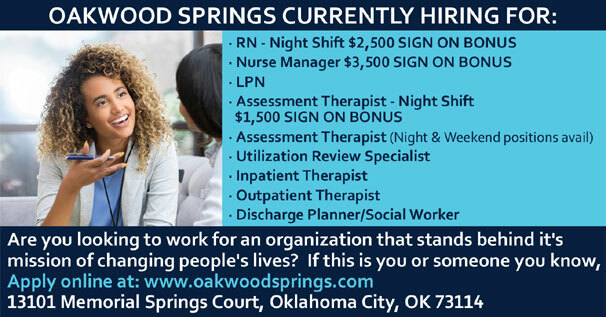 with outpatient services in Moore and dozens of physician clinics located in south central Oklahoma. A. There are many people who feel this way! Countless individuals are in relationships that aren’t working. It is interesting how people can continue in an unsatisfactory situation for a very long time until something or someone decides to make a change. Emotional pain just like physical pain seeks relief. It is sometimes difficult to tell your partner that your needs are not being met and you need to feel loved. The following is a true story of a married female who desperately tried to get her husband to love and nurture her. (Names and specific details have been changed). Karen had been married to Kent for 8 years. They had 3 children. Karen had been feeling lonely for months. She would try to get Kent to talk to her about more than just the kids and the bills. She longed for intimate conversation and time together. She said Kent was always in motion, made weak eye contact and always had an excuse for his lack of connection. One day Karen left the house to run her usual errands. She wanted to buy some new music and stopped to look at some CD’s. Mark was also looking at CD’s. They started talking about different bands, favorite venues and their fondness for music. Mark mentioned going for coffee and continuing their talk. Karen said yes. Karen was like a sponge for conversation. Especially someone who shared her love for music and a desire to talk about it. They met more often and as time went on they developed strong feelings for each other. Karen had decided to ask Kent for a divorce. She actually felt that he would not be that upset because he had not shown an interest in her needs for a very long time. Karen was wrong. Kent made her put a stop to her relationship with Mark. Refused to give her a divorce, then went overboard to meet every need she had ever verbalized. But it was too late for Karen. She chose to stay in the marriage but was not optimistic it would last. Time has a way of changing people. Relationships need to be nurtured and revisited periodically to see if both people are on the same page. People grow, sometimes in different directions. You can’t make someone love you in the way you want, if they can’t or won’t. Stephanie work on you. Read books. Go to therapy. Ask your spouse to go with you. Don’t give up until you know what is healthy for you or as my therapist said to me, “How is this working for you?” It wasn’t!! Every April, LifeShare of Oklahoma celebrates National Donate Life Month, focusing national attention on every individual’s power to make life possible by registering their decision to be an organ, eye and tissue donor. Bicycles serve as a symbol of progress, renewal and the moving circle of life. We each carry the potential to help make LIFE a beautiful ride for ourselves, and then for others by registering as a donor, considering living donation, being a caregiver and championing the Donate Life cause. The NDLM bicycle theme and art will be incorporated into celebrations and events across the country during April. You can register your decision to be an organ, eye and tissue donor at RegisterMe.org or in the Medical ID tab of the iPhone Health app. Currently, 61% percent of adults in Oklahoma have registered their decision to be organ, eye and tissue donors. Yet the number of people in need of transplants continues to outpace the number of organs donated. There are more than 115,000 people nationwide waiting for a transplant and a second chance at life. On average, 22 people die each day because the organ they need is not donated in time—that is almost one person dying every hour. You can help by registering your decision to be an organ, eye and tissue donor, and learning more about donation. LifeShare is a nonprofit, federally designated organ procurement organization (OPO) dedicated to the recovery of organs and tissue for transplant purposes. We work closely with four transplant centers and 145 healthcare organizations in the state of Oklahoma to facilitate donation. Additionally, we strive to raise awareness for organ, eye and tissue donation and transplantation through public education. For more information about LifeShare, please visit www.lifeshareok.org.